The dictionary says developing means to grow, advance, and mature. 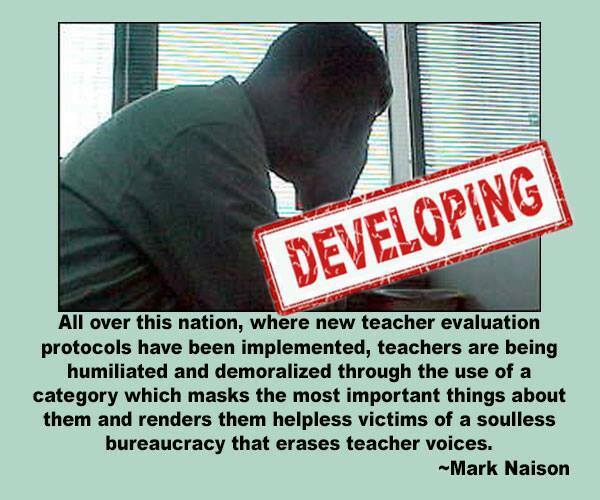 In NY State a teacher rated developing is not considered to be effective and a teacher improvement plan (TIP) must be implemented the following school year. On any given day a teachers interactions with students can range from INEFFECTIVE to HIGHLY EFFECTIVE and ideally all teachers are continually learning and DEVELOPING. Using a single standardized test score along with three to five classroom observations over the course of a 180-day school year is clearly an unreliable and INEFFECTIVE way to measure student learning and teacher quality. 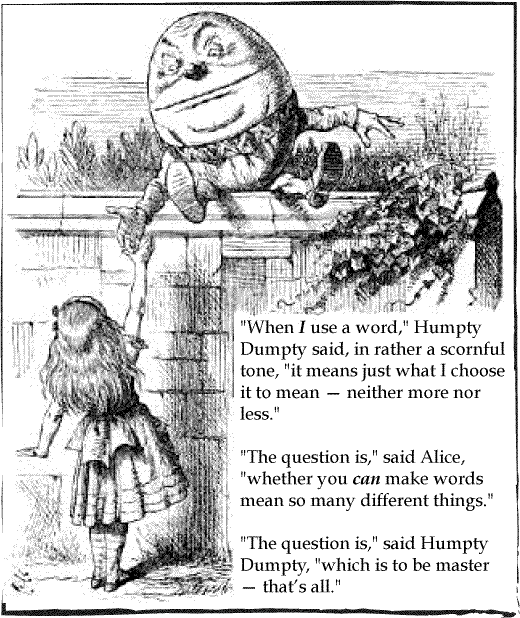 Humpty Dumpty reformers claim the Common Core will ensure career readiness yet the standards do not call for additional trade/vocational pathways and job shadowing, apprenticeships, internships, job mentoring, work-based learning are nowhere to be found in the standards. There is no force strong enough on this earth to prevent that. There is no amount of hand-waving, there‟s no amount of saying, “They teach to the standards, not the test; we don‟t do that here.” Whatever. The truth is – and if I misrepresent you, you are welcome to take the mic back. But the truth is teachers do. The Common Core will – by design – make some courses more difficult for many students, and for marginal students that may be enough to nudge them out of school altogether. Humpty Dumpty reformers say education reform and standardized testing is a civil rights issue while threatening to punish civil disobedient children and parents who opt out of standardized tests and placing gag orders on students and teachers to restrict and prevent them from discussing the poorly designed and written tests. 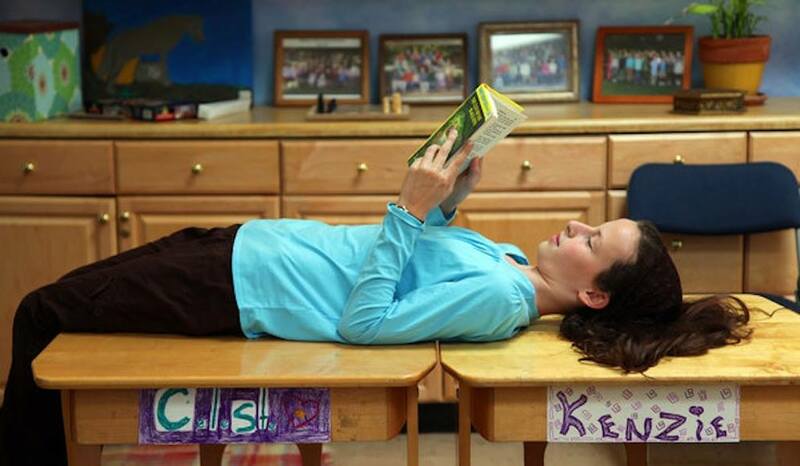 “Students in grades 3-8 are required by New York State to take standardized tests annually. No students should be required, however, to take tests that subject them to hidden advertising. Humpty Dumpty reformers claim the lack of academic progress and poor performance of learning disabled students on grade level standardized tests without accommodations is proof these students are receiving a substandard education and they are not being tested enough. In contrast, The National Center for Learning Disabilities has reported on the lifelong challenges faced by learning disabled students and that individual academic progress may be incremental and inconsistent depending on the accommodations and services provided to the student, and the specific nature and severity of the disability. No matter how many times it’s been said, it needs to be repeated again and again: learning disabilities do not go away, and LD is a problem with lifelong implications. While I fully support holding all students to the same high academic standards, I do not believe it is fair to deny learning disabled students testing accommodations that enable them to equally “access” the readings and questions on the test so they can fully demonstrate their knowledge and critical thinking skills. Humpty Dumpty reformers convince parents that students must close read in order to be ready for college and careers while the National Institute for Literacy Equipped For the Future (EFF) program has determined that Reading With Understanding is a more appropriate skill because..
Humpty Dumpty reformers promote and sell Personalized Learning as a way to catch up delayed and disabled students via technology and digital tools that deliver and pace course materials according to individual academic needs and abilities. Personalized learning means instruction is paced to learning needs, tailored to learning preferences, and tailored to the specific interests of different learners. While Humpty Dumpty reformers convince parents that more screen time is actually a good thing for young children who are still developing critical social and emotional skills, ed tech leaders send their children to schools that shun technology. The Common Core testing regime is designed to annually identify those students who have not successfully mastered grade level math and ELA standards and those teachers (via VAM) who are not performing up to those standards. Yes, we have had learning standards before, but parents and teachers also understood that students are not standardized and they will learn and acquire new skills in their own way and at their own pace. 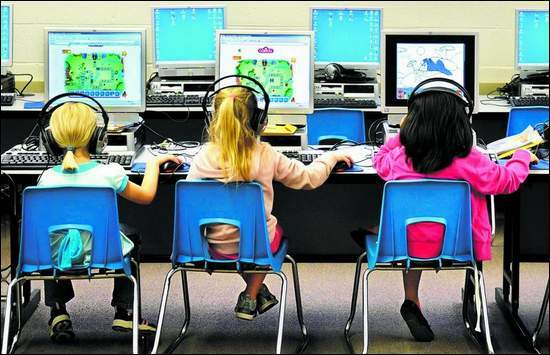 The Common Core expects all students to acquire new skills in a synchronized way. One year a student may lag behind in a subject area and the next year when they are cognitively and developmentally ready they may jump ahead of other learners. That is why grade-span testing is a more reliable means of measuring student learning but not as profitable for vendors selling their “personalized” software solutions. Some people have stronger math or writing abilities than others and that is OK. People will gravitate towards those college programs and careers that allow them to exploit their academic, vocational, and social/emotional strengths and capabilities. The college and career “promise” of the Common Core has become more rhetoric and a scare tactic to manipulate and convince parents that their child “needs” additional sit and learn math/ELA computer time to “catch up” with peers before the end of the year standardized test. That is why some parents don’t protest when their children are parked in front of a computer for an extra class period rather than drawing a picture, playing an instrument, or engaging in other creative and physical activities that cultivate fluid intelligence and unleash other talents a child may have that also lead to careers. These adaptive and personalized programs may engage students and artificially increase their math skills and reading scores, but researchers have questioned whether this type of digitally-enhanced learning and problem solving is lasting and transferable. “When a resource is intended for use as part of formal education, however, educators and developers must be concerned with more than what learners do when using the product. Just as a personal trainer may improve your conditioning and work out performance in a gym, running on a treadmill or riding a stationary bike are not transferable and applicable skills to activities such as playing baseball, snow boarding, skiing, surfing, rock climbing, etc. Students will acquire new skills when they choose to engage in a novel learning activity rather than solving a standardized problem or a virtual task that continually adapts and adjusts in order to engage with them. In the real world, it is the student and employee that must learn to adapt and adjust to new situations as they acquire transferable problem solving skills while developing their own techniques and strategies to successfully complete non routine tasks. Humpty Dumpty reformers continually complain about added college costs as some parents must pay for 1st-year remedial math and ELA courses for their children who are not “college ready” and they do not earn college credits for these classes. It is foolish to worry about the cost of two college classes rather than the enormous “price” our diverse and talented K-12 learners are going to pay every year as they receive less instruction in other content and special areas in order to make room for more remedial Math and ELA computer time in their schedule. Unfortunately increasing numbers of students are going to spend much of their K-12 schooling trying to improve math and ELA skills rather than having the freedom and opportunity to discover their talents and pursue their passions in other content and special areas that cultivate equally important career-related skills and abilities that the students actually excel at. We must remember that intelligence is not enough. Intelligence plus character–that is the goal of true education. The complete education gives one not only power of concentration, but worthy objectives upon which to concentrate. Kevin Huffman was forced out from the position of Education Commissioner in Tennessee for shady practices related to TCAP. He is pro-common core, pro Pearson, pro charter schools over public schools, and anti teacher.